Event planners strive to get greater ‘buy-in’ and an emerging trend is to do this using co-creation and collaboration during the planning stages. Here are 6 steps to co-create and collaborate, with some useful tools and tricks to help. Are you an expert in what your attendees want in terms of content? How do you know what you have programmed is going to be a hit with them? These are crucial questions when creating your event concept and the content programme for an event. You need to get to a point where the content and programme are what attendees want, not what you think is best for them. Your role is to aggregate demand and represent that demand in the most creative and immersive way possible through your skills as an event professional. Event planners face plenty of challenges when creating an event. First, each event is a product in itself – a unique experience that needs to attract attendees. Second, your event has an objective, and you – as the planner – have to make sure that the objective is reached to ensure event success. The content is the key to engaging attendees in a positive experience and you have to get buy-in from the get go. Lastly, the challenge is identifying stakeholders. That includes attendees. You may have a great database but who in that database is convinced that your event is a must-attend occasion? These challenges can be overcome by democratising how you plan an event. Democratisation creates buy-in to an idea and at the same time releases strength in the form of collective intelligence. Philosopher Pierre Lévy is one of the few major philosophers working on the implications of cyberspace and digital communications in society. He created the concept of collective intelligence. It is as a form of a collective knowledge, constantly enhanced, coordinated in real time, and results from collaboration and a consensus in decision making. Shared group intelligence that emerges is stronger than individual views on a subject and results in an overall group decision based on democratisation. According to collaborative innovation consultant Martijn Pater, the ideas within the collective can offer a fresh perspective on what you are trying to achieve. The collaborative approach to co-creation results in unique perspectives on your event. It is made up of the opinions of the stakeholders that you would like to involve in co-creating an event. However you may want to vary the degrees of involvement. For an internal sales conference where sensitive company information is to be discussed you need to limit your reach by using a closed information network. For a cultural festival you want to reach out to as many people as possible through as many channels as you can – this is true crowd sourcing. Clearly state the purpose and goal of the event and then set out the framework for participation. This can be done by creating an event website in a simple format. Here you would describe the event objective and then ask for contributions in terms of what you want opinions on. For example, entertainment, food and drink, speakers, workshop topics and more. Another thing to consider is feedback from similar events you have done in the past to inform the objectives framework you create. The content all depends on your event objectives so make sure that your framework is fit for purpose. The initial framework could be sent out to your attendee database via an email inviting them to join a collaboration website or event page. Email platforms such as MailChimp can start the process and point people to an event collaboration page. Padlet is simple way to do this for a closed network. You could also post a link of your event page to Reddit. Promote the link to your network and ask people to comment that can be commented on, upvoted or downvoted by anyone. The golden rule is to make participation easy. Using the major social media platforms is a good way to get ideas for your event. You have already started the participation process in Step 1, where you have communicated your objectives and collaboration framework, and directed people how to get involved, for example through a Facebook event page. To inspire participation, the event page should explain the benefits of contributing to the content of the event. You can devise a mechanism to reward or incentivize greater participation. Work with your other stakeholders, such as sponsors to offer prizes and other incentives to contribute, comment and share the information you are going to collect. You can use a simple application like Klout that is attached to a hashtag for the event and each time a contributor shares or RT’s via Twitter, their Klout score is recorded and you can reward those at the top of the Klout leader board. Pierre Lévy’s research is about collective intelligence and cyberspace. Social media as already discussed is a great way to create the critical mass needed to gather as much collective intelligence as possible. Know your potential attendee and what social media channels they use. Whilst it may not be economical to create a specific website, using cost efficient social media channels are the way ahead! For example, you can create a Facebook event that is restricted to a specific set of contacts or you can create a public page open to all. For internal corporate events, enterprise applications such as Yammer provide the tools to set up company wide conversation where you can start the idea collection process. For public and external corporate events the usual social channels will do. 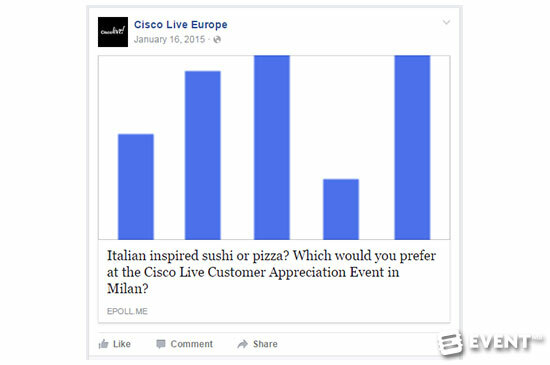 A very large event that uses EPOLL.ME as well as Facebook and Twitter to gather opinions on merchandise and the catering at their events, is Cisco Live. SXSW is well known for crowd sourcing their speakers through a public poll called Panel Picker. Reddit is a good platform for public opinion too. Comments can be up-voted by readers so the best ideas are seen at the top of the page. Incentivising contributors to comment, post and share will result in greater involvement in the process and of course, more ideas. Using Slack or WhatsApp groups is also another way to implement the process for smaller events or closed groups of contributors. There are also collaboration platforms such as Trello you can make use of for closed groups too. Ideas can be assessed by the crowd. Based on shares, likes and feedback on the chosen social media channels you will start to get a picture of the most popular ideas that emerge. 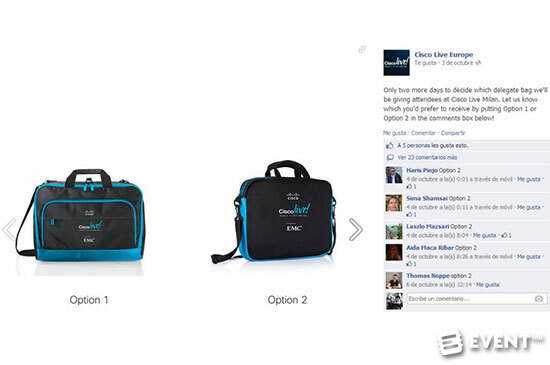 In this example, Cisco used Facebook for attendees to decide on which bags were offered at Cisco Live 2015. Depending on which platform you use the best ideas are always going to get more likes and shares. This is easy to identify with the way in which most social media channels are configured. Count the shares and likes to reveal the winner. This is where you record the popular ideas and start to set out a content programme as well as the other tangible aspects of the event, like Cisco Live did for their catering choices. You can even get in contact with individuals to get a deeper or clearer explanation of what they are suggesting.Selecting the best is your job but you can go one stage further and get the final content ideas reinforced by the crowd. Ask questions about the top ideas and offer further rewards and incentives to encourage participation. You could create a ‘decision day’ promotion that could be linked to ticket sales or registrations for the event. All the top ideas could be placed on an event web page and then voted on. Your job is done. You have content that is relevant to your potential attendees. You have successfully created an awareness about your event and this helps with marketing via pre-event engagement. Importantly you now have buy-in to your event by people who have an emotional link to it through their commitment as part of the creation process. These people are going to be key social influencers to help you promote your event. Get in touch with the influencers and incentivize them to help you market the event through their networks. Democratising the creation of an event is something that is becoming more and more popular. Using this six step process to create an event that people have an emotional link to and will be more than happy to share with others is going to make the event both relevant to their peers and provide you with a distinct way of marketing the event on digital platforms. By using collective intelligence to create your event you – as an event organiser – have recognised the importance of your attendees who in return will recognise you for being both innovative as well as showing an interest in what they think and feel before they arrive at the door.